Product #22046 | SKU NKE6S-10-WOC | 0.0 (no ratings yet) Thanks for your rating! The preassembled 32.81' (10 m) etherCON Cat6 Patch Cable with Cable Plug Carrier on One End from Neutrik is a shielded S/FTP cable with a cable plug carrier, which offers a robust metal shell and push-pull locking system. It provides data transfer rates of up to 10 Gbps. Moreover, the cable's shielded system provides high noise immunity and EMI protection. The etherCON Cat6 Patch Cable provides data transfer rates of up to 10 Gbps. 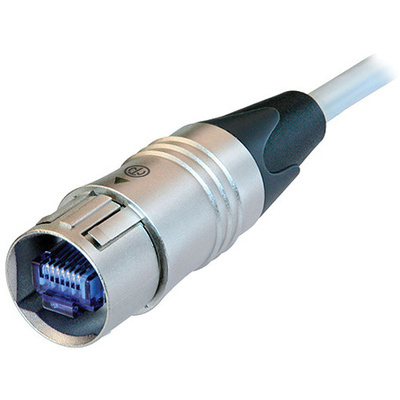 The cable offers true Cat6 performance with fast data transmission and supports high bandwidth applications. Cat6 specifications meet TIA / EIA 568B, ISO / IEC 11801 and EN 50173 standards. It meets IP65 standards and is dust and waterproof in mated condition. The cable's shielded system provides high noise immunity and EMI protection. Its push-pull mating mechanism provides a secure and proven locking system. The cable features a rugged cable carrier and a unique chuck-type strain relief.